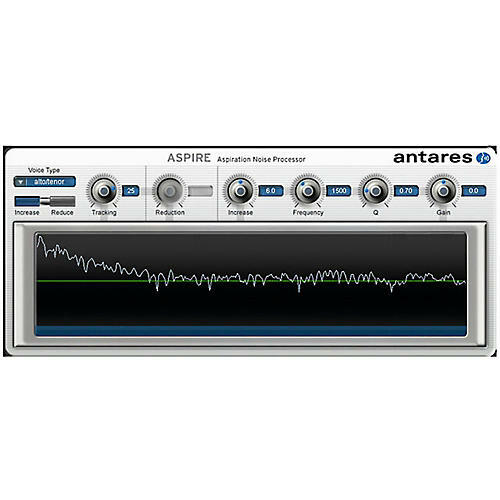 Whether you're looking for a touch of breath for a pop ballad or full-on raspy grit for blues or punk, Antares ASPIRE Evo has the power to add the character your vocal tracks need. What's even better is that ASPIRE Evo will affect only the breathiness of your vocals, without otherwise affecting its harmonic characteristics, so the basic character of the performance remains the same. Don't let that fool you though, the effect of ASPIRE Evo can be just the touch your tracks need to stand out in the mix, without drowning out other instruments or taking up too much sonic bandwidth. Reduce rasp, or add in some smokiness to your vocal perfomance with ASPIRE Evo. ASPIRE Evo authorization requires an iLok2 USB smart key and the ability to access ilok.com (on any computer).